Two player abstract strategy games are easily the most played subset of games on this planet, what with all the big classics being there: Chess, Go, Shogi, and the list goes on. But all those games tend to be long and ponderous, when you’re looking for something to play in 10 minutes or less you don’t usually go for Go. But modern games to the rescue, abstract games that require strategy to win but are still quick to play do exist. 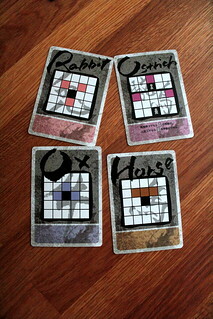 One such game, released last year, is Shimpei Sato’s Onitama. Both players start with their five pieces on their base line of the five by five squares playing field: the Onmyo in the center, the Puppets to the sides. The game is not quite 100% abstract, by the way. There’s a bit of story behind it, in the same way that Chess is a game about two armies at war. In Onitama, the two Onmyo are the children of a famous onmyo master, a mystic telling the future and summoning spirits. They both think they should inherit that title, and so they launch into a battle over who has more control over the spirits. In each game, five spirits are present – out of 15 in the game – and to win you either use them to take your opponent’s Onmyo piece or to bring your own Onmyo into your opponent’s starting position. Both players will always have two Spirit cards in front of them, one more card lies to the side of the board. On their turn, a player picks one of their two Spirits to possess one of their pieces and move it on the board. Each Spirit card highlights the directions where it can move a piece. For instance, the Ox Spirit can move a piece one step forward, straight left or straight right. Another example, the Monkey Spirit moves front-right, straight right or back-right. When that move takes the piece on the same square as an opposing piece, it captures the enemy and removes it from the board. So far, so easy, here’s where it gets interesting. After using a Spirit card, the player puts it aside and takes the Spirit that is currently waiting on the sideline to replace it. Next, her opponent will make a move, put the Spirit used aside and take the Spirit the first player used before instead. 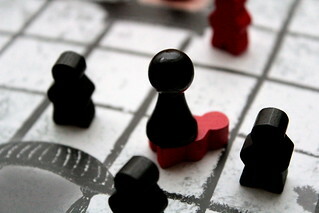 The five Spirits will thus go back and forth between the players, and which Spirit you pass to your opponent is at least as important as your position on the board. With the Spirits, you decide on the options your opponent will have to move. If you need a specific Spirit to make the move you need, all you can do is try to force your opponent to use him. But he won’t be inclined to give it to you. That creates a very interesting dynamic between the players. With each game using a different mix of Spirits, there are big differences in how a game turns out. A game with Spirits to move in every direction is very different from a game where the Spirits move mostly to one side. When you have the Monkey (see above) and the Rooster (moves straight left, back-left, straight right, and front-right), then your pieces will end up mostly on the right side. Since your opponent turns the cards to face him, his pieces will end up on your left side and you’ll spend some time maneuvering to get into an attack position. But with any combination of Spirits, games will last 10, rarely 15 minutes. That makes Onitama a game that fits any break you might have, and you’ll spend that short time thinking about how to win, not replaying a standard opening. That makes Onitama my current favorite short game for two players, I’m pretty much always happy to play it. And it has a great minimalist design, too. That seems to be specialty of Japanese game artists, and Jun Kondo did a great job of it.